Originally, the house was a hospital fondouq where the last birds of North Africa was. It is said that a very wise man lived there to care for storks, hence its name (“Bellarj” meaning “stork”). Subsequently, this fondouk was destroyed to give way to a house; the latter, after the protectorate was transformed into a school. Abandoned a good ten years, the house was taken around the 2000s by a couple of Swiss architects, Susanna Biedermann and Max Alioth (1) to establish a foundation. 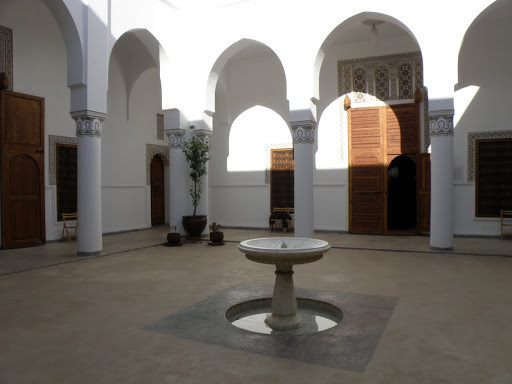 If many cultural institutions have claimed to bring culture to people who are poor, the strength and originality of the Foundation is to have understood that that was the essence of Moroccan culture was more related to traditions, at oral practices, original and modern, it was essential to recognize, value. Better aware that cultural activities can not ignore the social realities, the Foundation (2) argues, for example, initiatives such as the Albassar Association which works to screen for cataract among craftsmen. That’s one of the few places in Marrakech where different worlds come to mingle and socialize: families present in the medina for generations, on one hand, and new residents of foreign origin, on the other, and this , regardless of age or social level. (1) Susanna Biedermann and Max Alioth * also funded ESAV (School of Visual Arts). This equipment of exceptional quality, unique in Africa, open to students from across the continent, brings together graphic art section and a movie section. Ramadan Timetable: 9 am to 15h.